Cinematography by Eric Gautier A.F.C. 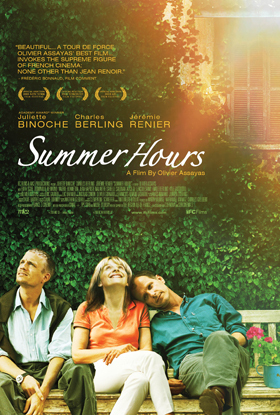 “Summer Hours”, Olivier Assayas’ latest film, opens with children running free through gardens and woods around a typically beautiful French summer home. Filled with antiques and objets d’art, the house belongs to the Berthier family, whose matriarch is the 75 year old but still stunning Hélène (Edith Scob). Hélène owns the art collection that was handed down to her by a deceased uncle, a famous artist himself, with whom she may have had an intimate relationship years earlier. Now, at the end of her life, Edith is beginning to make the practical preparations of passing along the collection and the house to her three grown children, Adrienne (Juliette Binoche with blond tresses), Frédéric (Charles Berling) and Jérémie (Jeremie Renier). Only Frédéric, himself the single father of a tempestuous daughter, is the only one of the siblings who wants to keep the beautiful house and leave it to the next generation. Both Adrienne and Jérémie have jobs and lives that keep them both physically and emotionally distant from France. It is emotional distance that is at the heart of Assayas’ beautiful story.